Catch Justified star Timothy Olyphant on the /shows/archer/second episode of Archer: Season 4, "The Wind Cries Mary", which airs January 24th, 2013 at 10:00 PM ET/PT only on FX. We have the first official look at Timothy Olyphant as Lucas Troy with an exciting, snow covered new photo that is sure to blow the pockets off your pants. Check out this fire breathing dragon of danger and his new best friend, 'Mr. Gun'. 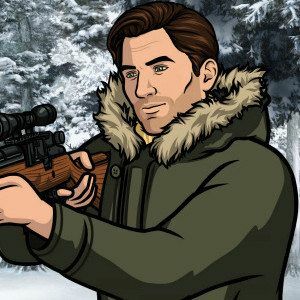 Timothy Olyphant lends his voice to "Lucas Troy", the former best friend of Agent Sterling Archer. In the episode, Archer and Troy are holed up in the Vermont wilderness, fighting hard to come out on top. Whatever that means.